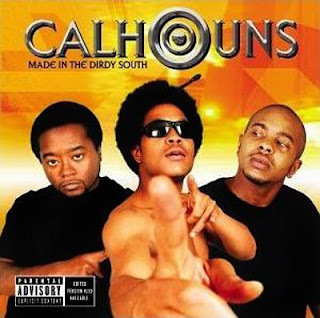 The Calhouns is a group from Atlanta, GA. It consists of Cool Breeze, Swift C and Big L. The three members are also known as Freddy Calhoun, Pauly Calhoun and Lucky Calhoun. Members Pauly and Lucky were known as the Sniper Unit in the late 90's. Later on they added Cool Breeze to their line up and changed the name to The Calhouns. This group also holds membership in the second generation of the Dungeon Family. Made In The Dirdy South is their debut album and it was released in 2002 on Empire Music Werks. The crew behind all the production is Organized Noize along with Swift C. The imaginative beats are crisp flowing and cutting edge. They are mostly sample free and are arranged very infectiously. The lyrics is where the album falls a little short. Although their rhymes are not ground breaking, they are still pretty jubilant. Featuring on the record is Slimm Calhoun, Big Howg Major and Decatur's own KB. Overall it was a decent effort by the group but unfortunately there was not enough lyrical substance to take this album any further. Haven't had a chance to listen to this album yet, looks dope!